D a n c e s W i t h W o o l: Finally R A I N !!!! Finally R A I N !!!! It is grey, raining, the temperature is few digits over zero - all in all this is very, very good. Last night I listened to the rain: it was steady, the thrumming on the roof was very persistent and I was extremely happy. I almost could not sleep, the sound was so welcome. It is rain - not SNOW, finally. Every single drop is taking us little closer to the summer - I am already dreaming of the sounds of the waves and the soft whisper of the forest when the summer wind passes through every little leaf. I had to draw a new blog header and I on purpose made it pale because that is very much how the world is right now, it is lacking colors: early spring and no sun. Actually, there is plenty of grey and brownish grey (old snow blanket) and this icky yellowish grey (ice cover on the lake). Even thought the dog is raking, we are not quite there yet. I don't have new news on the baby cardigan, I have had many road blocks and I still need to figure out the collar, I don't have a clue what to do with it. 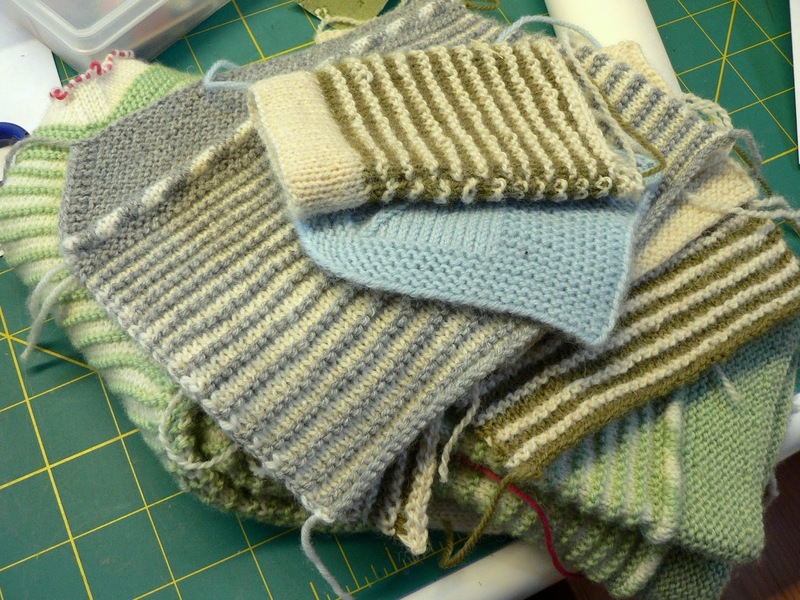 If you look closely at my swatch pile, it is growing, and there at the bottom, lies almost completed little cardigan. I am keeping it as it is, because it will give me good reference points when needed and then I believe that if I stare at it long and hard, I will see the collar. It has not yet happened, even though I have been diligent in staring. Lately I have been knitting with Kollage Yarns square needles and I really like them. I don't have any pain in my hands while knitting, but at times I will switch hands, I will go from continental to picking and then back. I have been doing this a lot more lately, before I would pick when knitting cottons or heavy yarns but these days, I pick even with my default setting (wool, small needles). 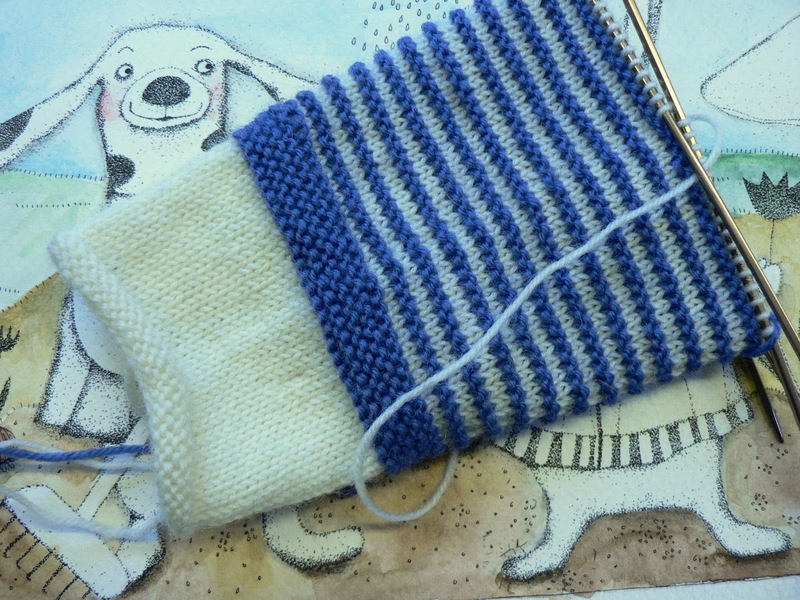 I am not sure why I enjoy the square needles so much, whether it is just the change or if it really relieves the stress. Anyway so far I have only square dpn's but I have already taken action, and hopefully while I write this my order is being processed. i have often thought that a "baseball jacket" collar would work well for a baby because it would come up high on the back of the neck but then taper down to nothing in the front, where babies usually don't have much neck. I, too, love the square Kollage needles. I seem to knit faster and more evenly, without the annoyance of yarn slipping off. The animals in your newest header seem to be enjoying the intimations of spring, as we are in Ohio. Lots of pale blossoms and green leaflets. Finally! Love the new header--it made me smile! I love how excited you are about your rain; I'm going to enjoy ours tonight also. I also love how excited your animals are about Spring - dancing, raking, smiling, and enjoying the bulbs. Thanks for sharing the happiness! Congratulations on your spring! It has been slowly warming here and we have had spring flowers and tree buds slowly appearing, but today it was mid-70s F and now it is raining and so I understand very well when you say how wonderful it is to hear on the roof. Hope you too have spring flowers soon! I love your new blog header and I am jealous of your rain. It is still snowing here. Sigh. No sign of Spring yet for me. 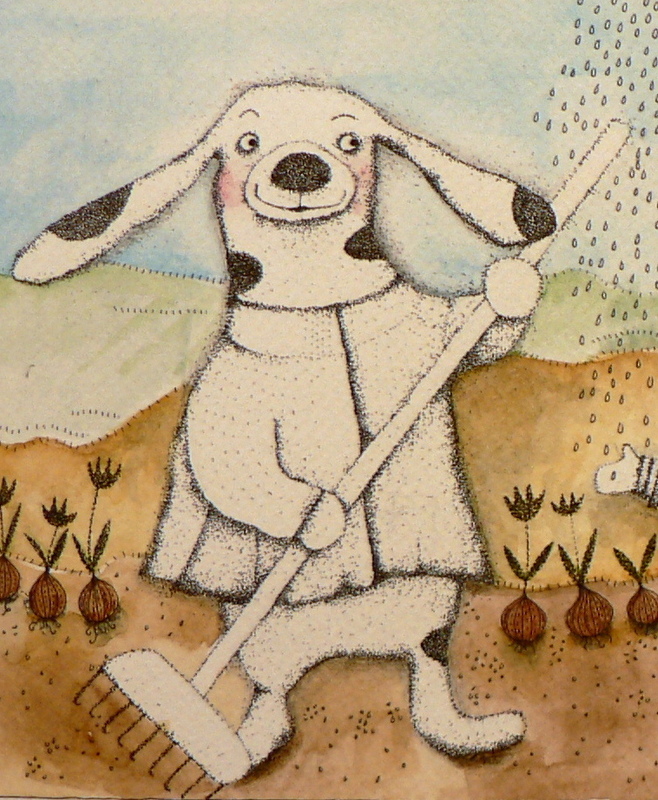 Congratulations on the spring rain! Love the new header, you are very talented. Spring has been a long time coming here in Chicago but it has finally arrived. I must look for square needles and see what they are like, you always knit so lovely. I am the same with my hands, I must teach my continental knitting to give my right hand and fingers a well deserved rest. As you are waiting for spring and summer I am waiting for a lovely autumn and winter, I like it a bit cool, we don't get snow were I live (it is 4 hours drive away and only in a small area)so I really enjoy reading your blog all year around and seeing where you live. I love your art work! The drawings are so soothing to look at. Any picture book with your drawings in it in the future??? Even your swatches are beautiful! Book?